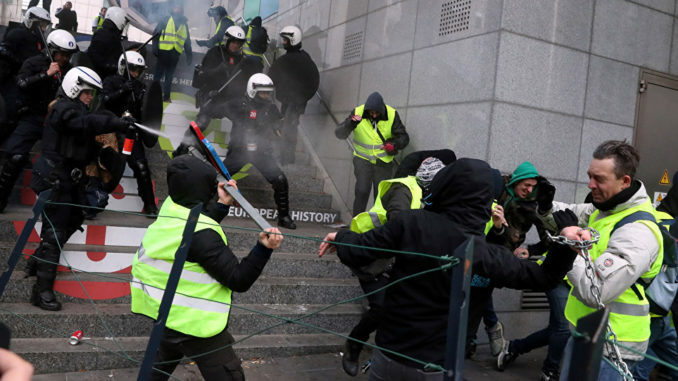 Thousands of citizens have taken to the streets in Brussels to protest globalism in solidarity with the Yellow Vests. The protest, dubbed the ‘March against Marrakech’ in reference to the controversial UN migration pact, was met by police officers firing water cannons. Rt.com reports: It was organized by the right-wing Vlaams Belang party which has long been a vocal opponent of the agreement. While having initially kicked off peacefully, the demonstration started to heat up with some of the participants burning firecrackers and hurling bottles as they marched down the street. Part of the crowd who rallied on Sunday, also vented their anger by rooting out and throwing around traffic signs and what appeared to be parts of some fences. Riot police marched out in full riot gear to quell the unease. They later moved in with water cannon against some of the protesters. At least two of them were seen being sprayed with water cannon right in their faces. It is not known whether any serious injuries have been caused by the hit. One of the videos from the unrest shows how a chain of riot police sprint towards a small group of people (presumably demonstrators). Just moments later at least two of them are being encircled by the riot officers and beaten with batons. A male also gets a direct pepper spray hit in the face from the closest range. After walking just a few meters – apparently completely disoriented – he then collapses on the pavement, with police running past him. Police said that at least 5,000 have gathered in the Belgian capital. A separate counter-demonstration of around 1,000 people, organised by left-wing groups and non-governmental organisations, also took place in the city centre. The UN-backed pact promoting an international approach to safe and orderly migration was formally approved in Marrakech, Morocco earlier in December. The accord split global powers, with Austria, Hungary, the US, Israel and several other countries rejecting the pact. Its critics claim that the deal is inadequate for managing global migration flows. The Belgian government suffered a blow after the center-right New Flemish Alliance (N-VA) quit the ruling coalition because of its disapproval of the accord. Prime Minister Charles Michel announced that his government was set to continue as a minority.